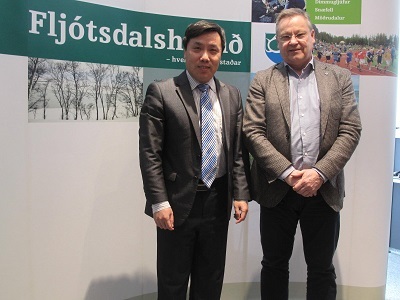 On April 2, Chinese Ambassador Jin Zhijian met with Mayor Ingimarsson of Egilsstadir, the biggest city in East Iceland. The two sides exchanged views on tourism, culture and friendship cities cooperation, Mr. Öðinnsson, who in charge of economic and cultural affaris, also attended the meeting. Ambassador Jin introduced the economic, tourism and cultural cooperation between China and Iceland, and pointed out that the local government exchanges enjoyed great potential. Egilsstadir is an important city in East Iceland, and the Chinese Embassy in Iceland would be glad to offer assistance in promoting more practical exchanges between Egilsstadir and local governments in China. Mr. Ingimarsson welcomed Ambassador Jin to visit Egilsstadir, and introduced the economic and social development, city construction and future development plan. He thanked the Chinese Embassy for its efforts to promote local exchanges between the two countries and expressed its willingness to further strengthen exchanges and cooperation with local governments of China.